Book any vehicle with selected suppliers on this website before 31st January 2010 and get 4% off the base rental rate. Travel dates must be between 1 May - 30 September 2010 to qualify. Place a booking by February 28th 2010 and travel from 1st April 2010 to get massive 5% discount. 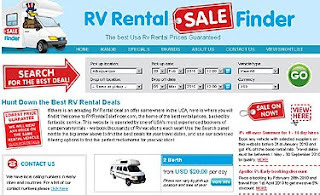 Visit RV Rental Sale Finder USA to snag these great deals!